Count Dante was an immediate descendant of the European nobility and a holder of Black Belt 8th Dan. He is a legend of the Karate world even today, some forty years after his death. Count Dante and his students amassed over one thousand trophies and awards in international competition. Among these are: World Champion 1963, ‘65, '67; World's Top Team 1963-'67; Professional World Karate Champion 1967; Professional World's Karate Top Team 1967; International Champion 1965; USA National Top Team 1964; Canadian Top Team 1965. On September 1 1967, on the basis of Count Dante's undefeated record in tournament and professional competition, the Directive Committee of the World Federation of Fighting Arts declared him to be the World’s Deadliest Fighting Master; based additionally on his having defeated the World’s Foremost Fighting Masters of the Fistic and Grappling Arts in “No Holds Barred” Matches. The Count was an expert in Judo, Jui-jitsu, Gung Fu, Tai Chi Chuan, Shaolin Boxing, Kempo, Karate, Yawara, Boxing and Wrestling, as well as holding a Black Belt in Aikido and a Master's certificate in Kibo. He was able to study these arts while serving as the Director of a wig and hair-piece firm based in India, China, Indonesia, Korea, and Japan; where he availed himself of the opportunity to train and practice with the masters of every field in addition to participating in and surviving several Oriental Death Matches. 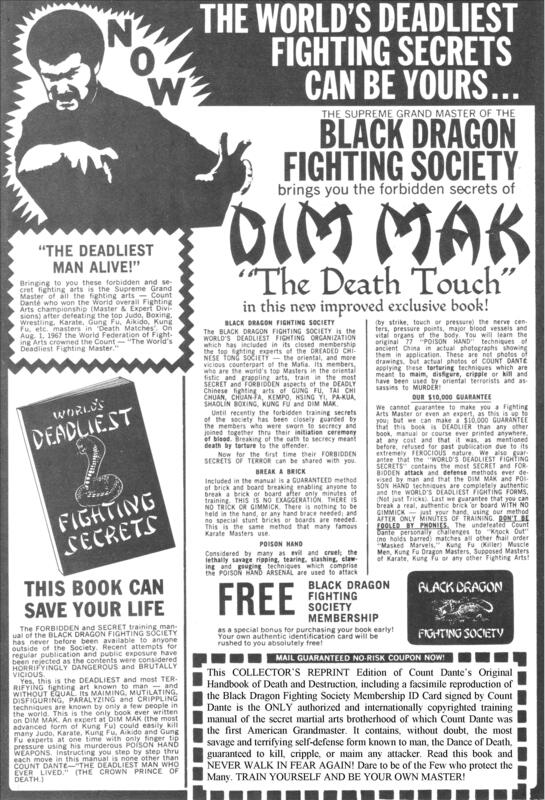 His forbidden and secret training manual of the Black Dragon Fighting Society has never before been available to anyone outside that fraternal membership. Initial attempts at regular publication in 1966 and public exposure of the contents were rejected as they were considered horrifyingly dangerous and brutally vicious. "Yes, this is the deadliest and most terrifying fighting art known to man- and is completely without equal. These maiming, multilating, disfiguring, paralyzing and crippling techniques are known by only a few people in the world." "An expert at Dim Mak could easily kill many Judo, Karate, Aikido, and Gung Fu experts at one time with only fingertip pressure using his murderous Poison Hand Weapons." Instructing you step by step through each move in this manual is none other than Count Juan Raphael Dante- the first man to reveal secret Kung Fu and Ninja Techniques to the Western World, and who was the self-proclaimed Deadliest Man Who Ever Lived!!! This is the book that made him famous. Included in this Membership Package is a numbered facsimile of Count Dante's Original Black Dragon Fighting Society Membership Registration Card. You will then be on file and have a Permanent Record with our martial arts fraternity. If you wish to upgrade to Affiliate Membership and have your martial arts credentials added to your Permanent Record and recognized with an 11 x 17 Certificate of Membership, Official Black Dragon Fighting Society Patch and Registry of Grandmasters please click here: International Fighting Arts/Official Black Dragon Fighting Society Membership.